The Special Projects Unit is designed to educate the citizens of Monmouth County through crime prevention, public awareness and safety programs. Special Projects Unit provides the opportunity for an exchange of information between law enforcement and citizens. The programs focus on reducing unwarranted fear of crime and improving the quality of life for the county community. Some of the successful programs originating from the Special Projects Unit include the IDENT-ADULT emergency photo identification card program, Refrigerator Cards and Crime Prevention Presentations, What Happens When You Get Caught, Prison Education Program (PEP) and Sheriff’s Prison Awareness Program (SPA). In the year 2001, the Special Projects Unit presented a total of 286 programs for seniors. 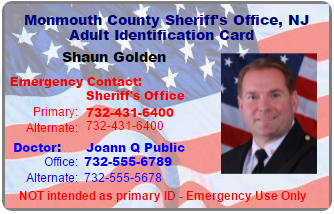 Approximately 3,600 seniors participated in the Ident -Adult Photo ID Program, and some 5,000 seniors participated in the Refrigerator Card program. Over 10,000 TRIAD calendars were distributed throughout the senior Community of Monmouth County.